"Leck mir den Arsch fein recht schön sauber" ("Lick my arse right well and clean") is a canon for three voices in B-flat major, K.–233/382d, long thought to have been composed by Wolfgang Amadeus Mozart during 1782 in Vienna, but now thought to be the work of Wenzel Trnka. In 1988, Wolfgang Plath presented evidence that the composer of this piece, as well as K. 234/382e, was in fact Wenzel Trnka (1739–1791). That Mozart might not be the author of K. 229, K. 230, K. 231, K. 233, K. 234 was already mentioned in the Bärenreiter Neue Mozart-Ausgabe (NMA) in 1974. 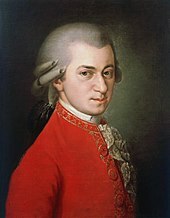 The Trnka canon's original lyrics were "Tu sei gelosa, è vero," but Mozart set the canon to his own scatological lyrics. Mozart's widow Constanze Mozart submitted the modified canon to publisher Breitkopf & Härtel. nice and clean, lick my arse. Everybody lick their arse for themselves. Shown in Bärenreiter's Neue Mozart Edition is the text as changed either by Johann Christoph Härtel (1763–1827) or by Christoph Gottlob Breitkopf (1750–1800) for the 1804 edition of the canons in Œvres Complettes by Breitkopf & Härtel. Leck mir den Arsch fein rein. Soll das denn Urtext sein? Soll das denn Mozarts Urtext sein?! Leck mir?! O nein, o nein! ist so weiss wie ein Schwan! Leck mir? Das kann nicht sein, nein! Soll das denn wirklich Urtext sein? Nein, der Mozart war ein feiner Mann! Lick me in the arse fine and clean. Should that be the Urtext? Should that then be Mozart's Urtext?! Lick me?! Oh no, oh no! Is as white as a swan! Lick me? That cannot be, no! Should that then really be the Urtext? No, that Mozart was a decent man! ^ Plath, Wolfgang; Bennwitz, Hanspeter; Buschmeier, Gabriele; Feder, Georg; Hofmann, Klaus (1988). Opera incerta. Echtheitsfragen als Problem musikwissenschaftlicher Gesamtausgaben. Kolloquium Mainz 1988. ISBN 3-515-05996-2. ^ Jutta Schmoll-Barthel; Sara Jeffe (October 2005). Silke Leopold (ed.). Mozart-Handbuch. Stuttgart: Metzler. pp. 640, 653, 689. ISBN 3-476-02077-0. ^ Dietrich Berke; Wolfgang Rehm; Miriam Pfadt (2007). "Endbericht" (PDF). Neue Mozart Ausgabe (in German). Bärenreiter. Archived from the original (PDF) on 22 July 2007. Retrieved 10 September 2007. ^ Catherine Carl; Dan Manley; Dennis Pajot; Steve Ralsten; Gary Smith. "Koechel List". Mozart Forum. Archived from the original on 14 August 2007. Retrieved 10 September 2007. ^ "Mozart Edition, Complete Works". Brilliant Classics. 2006. Retrieved 23 February 2016. ^ integralemozart.info (2007). "Mozart Complete Edition (Brilliant), Volume 8: CD 1, Canons" (PDF) (in German and Italian). Integrale Mozart. Archived from the original (PDF) on February 19, 2009. Retrieved 12 September 2007.